SA: Wow, Oscar Isaac I’d think that you’d have to be so excited to be the centerpiece of a Coen Brothers’ new movie. OI: Yeah, it’s literally a dream come true. I dreamed of being able to do a movie with them and for it to be this one, and that it involved music, is just the perfect thing for me. SA: How were you casted? OI: Pretty traditionally. I got an audition for the casting director, and she thought I was good enough to show the Coens to present to them. I came in for them, and they saw what I had to do. I learned a few songs and played that for them. A month later, they cast me. SA: Oh, my goodness. That’s so fast. OI: Not long, although it felt like the longest month of my life. SA: I bet it did. That’s great you got the call. I know that Joel and Ethan usually storyboard their movies. Did they do that with this one? OI: Yeah, they’d actually have the storyboards. Every day, the actors get their sides, so it has all the lines for the day. At the back of this little pamphlet, they have all the storyboards. That way, everybody’s on the same page. It doesn’t mean they’re necessarily going to shoot it exactly like that, but it’s just so everybody has an idea. SA: Sure. What did you learn from them? OI: Just how to … I think just to be open and look at the world a little bit childlike; deviously and innocently. SA: Sure. Thank you so much and good luck with the film. Sarah Knight Adamson: Hello, Michael. 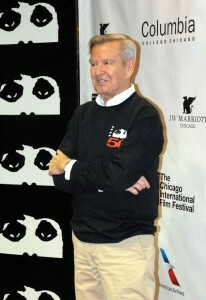 How do you feel on the eve of the 49th Chicago Film Festival? Michael Kutza: I’m excited because this kid is quite talented. This is Oscar Isaac’s first starring role. He sings and he’s quite good. Do you like folk music? SA: I do. I do. MK: Are you old enough to remember that Chicago was … this folk music scene? The film; it’s an adventure and it’s about coming to Chicago, which is why we happen to have it here in Chicago. SA: I love films about music. Were you one of the starting founders of the Chicago International Film Festival? SA: Gosh, what do you have in anticipation for next year, the 50th? MK: Throughout the year, we’ll show some of the winning films. Then, do the gala of something we discovered, or a director we discovered, and try to bring back a lot of directors. SA: You’ve built such a great reputation here in Chicago. The talent is amazing. Thank you so much for doing all this.